This replacment glass for the Aspire Atlantis Subohm Tank has a 5ML capacity! The original Atlantis has a 2ML capacity so this tank will make the Atlantis larger if you have the original. 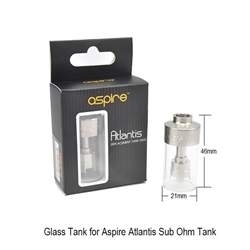 It is also the replacement glass for the Aspire Atlantis Mega.